A public lecture presented by Emory College of Arts and Sciences and the Office of the Provost. Parking is available in Fishburne Visitor’s Parking Deck, access on Fishburne Lane, via Dowman Drive on the Emory campus. Seating is limited, so we encourage you to request your free ticket from the links below. Anyone may order a ticket, but note that tickets are limited to two per person. 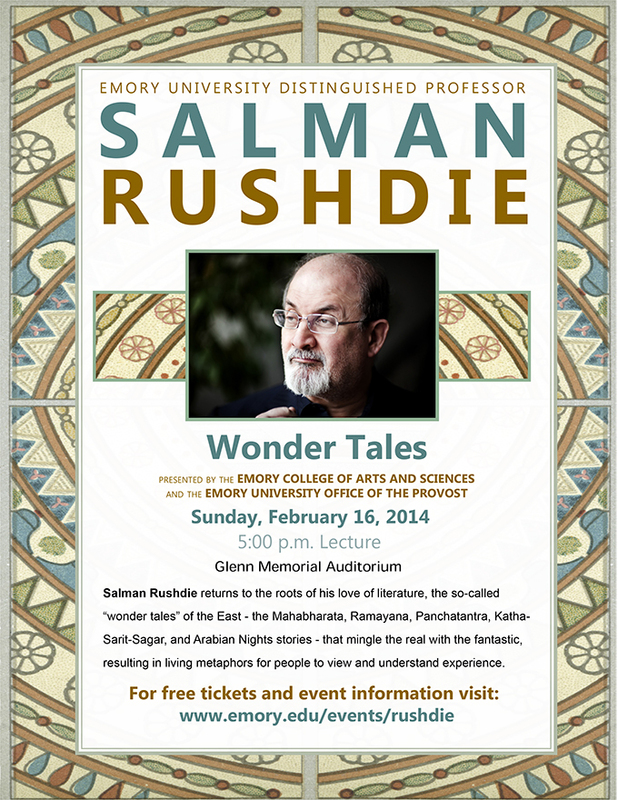 About the event: Salman Rushdie returns to the roots of his own love of literature, the so-called "wonder tales" of the East—the Mahabharata, Ramayana, Panchatantra, Katha-Sarit-Sagar, Arabian Nights stories, and the rest—which are still living, profound metaphors through which people view and understand their experience. They are also liberating for the writers who follow them, insisting, as they do, on the fictiveness of narrative, mingling the "real" and the "fantastic" with an equal belief, and disbelief, in both fact and fiction. Free tickets to this event can be requested by clicking here.